A strategic shareholder communications strategy can be instrumental in elevating the brand for many public companies. We had the opportunity to tackle this type of business challenge with Access Copyright. The organization wished to refresh the look of their Annual Report and take it into a new direction. 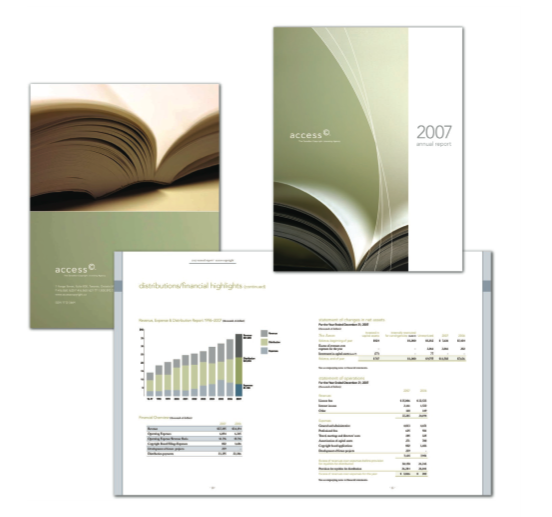 Wishing to imply a sense of trust and full disclosure to the general public, our theme for the new Annual Report was an "open book" which was a perfect fit as Access Copyright works with publishers to regulate and manage the distribution of copyright fees. The new Annual Report was combined with new brochure designs and banners leading up to the annual meeting of the board of governors and stake holders in order to enhance their communications and elevate the Access Copyright brand. Many companies struggle with the challenge of building a strong brand and get caught in the myth that a logo is a brand. We like to challenge that myth. A well designed logo and corporate identity is important but it is just the starting point of building a strong brand that will attract potential customers. Brand strategy impacts all the potential contact points and experiences you have with your customer and is much more than your logo. How you communicate with your customers. What level of service & support you provide them. How you engage them and meet their needs also are important aspects of your brand. Building a brand takes time and a step by step strategic approach. The selection of a design firm to handle the creation of your marketing materials or website is one of the most important decisions a company can make. These tips can help determine if a design agency can serve your needs while fitting within your budget. Examine portfolio materials such as logo designs, brochures, ads, corporate identity designs, and websites to get a sense of the style and quality of design work provided by the agency. Before meeting with the agency, prepare a clear summary of the work you are looking to have done and the results and objectives you would like to achieve. Be prepared to present your present marketing materials, your goals, timelines, and your budget. This information will be necessary for a design agency to make realistic suggestions, provide solutions, and a proper quote for your project. The work of the design agency should click with you and give you an indication of the style of work the firm does. In addition, ask for the "story behind the design". Good design agencies help you solve business problems. Ask about the challenge the client was facing and why the design agency presented the final design you see in their portfolio. Ask about their design team and their design methodology. Find out what the steps are in the design process, who will be working on your project, and who your primary contacts are so that you can have questions addressed. 5. Do they share your vision? The most important element is that the design agency understands your needs, objectives, and marketing vision. Their job is then to help you make it a reality and good, open communication is critical. Finally. Ask for a project proposal and quote so you can determine how the design agency proposes to meet your needs and help you reach your objectives within the budget you have provided. The travel industry has definitely raised the stakes in the last few years and realized that a good hotel is more than location, a bed, and room service. While the grand hotels still exist and attract a certain clientele, the new "boutique" hotels have come up with innovative product offerings tailored to the tastes of their guests. The key to any successful business is knowing your clientele and then offering an experience that will bring them back again and again. The Drake Hotel in Toronto & Listel Hotel in Vancouver have certainly taken that approach. 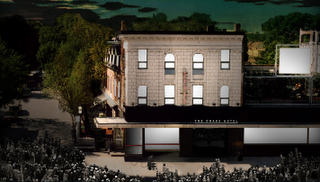 The Drake has become a landmark for what is happening in art & culture in the reinvigorated Queen West neighborhood and serves up a great hotel with a enticing dessert of music, entertainment, and art to its guests. The best hotels are more than a place to sleep but rather a destination to explore at the end of a journey. The Listel Hotel boasts art, elegance, and culture in each room with a showcase of art via a partnership with the British Columbia's Museum of Anthropology and the Buschien Mowatt Art Gallery. Good music, art, & sweet dreams! The perfect way to end the day. One of Canada's busiest intersections frequented by over 60,000 pedestrians daily has just adopted the pedestrian scramble format. A recent visit to the intersection this week reminded me of some of the important aspects of website design. 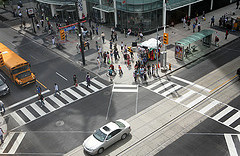 The intersection is a "pedestrian destination" driven by the "content" presented on all four corners by shopping facilities, business offices, dining, entertainment, Ryerson University, TTC transit, and the public space of Dundas square. It brings to mind the importance of well designed content & copy in generating relevant traffic to your website. Content is king and too often this important element is overlooked by organizations when developing a website. The other key element is how design impacts the user experience and engages the visitor. The new pedestrian scramble format provides easy navigation for pedestrians to quickly cross to any corner of the intersection and access the various facilities and "content" featured at Yonge & Dundas. Web design should also provide logical, clear, and functional ways for site visitors to access, enjoy, and experience your site. 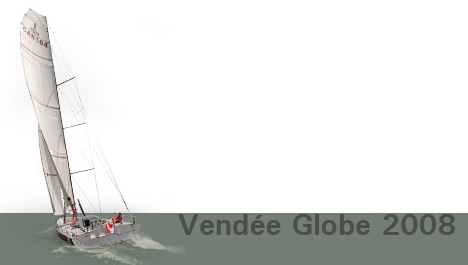 In November, thirty racing machines powered only by the power of the wind will leave the Atlantic coast of France far behind and head out into the ultimate challenge in ocean yacht racing, the Vendee Globe Race. The Spirit of Canada Open 60 yacht is a masterful combination of design and technology that has been funded by over 5,000 individual sponsors. This venture is an inspiring example of what can be accomplished by a strategically designed social media and marketing campaign. To date the team still lacks a corporate sponsor, but with over 270 hours of internationally planned media coverage, this is also an exciting opportunity for a major Canadian company to throw its support behind this round the world challenge and testament to the human spirit. Wishing you a safe journey & a fast boat, Derek Hatfield! The ad agency of Crispin Porter + Bogusky has a reputation for advertising campaigns that generate excitement about a brand, but they certainly have taken on a big challenge with the task of making Microsoft cool! The reality today is that it is not just about MAC OS vs Windows anymore! While Microsoft still remains a technology brand, Apple has successfully become a lifestyle brand. Apple has managed to craft an experience with Mac OS, iMac, iPod, iTunes, and now iPhone that melds design, technology, media, photography, and communication into a beautiful roller-coaster ride. The highly anticipated $300 million Microsoft ad campaign recently launched but response from viewers has been pretty bland. Jerry Seinfeld is funny for sure, but is he cool? Not in 2008, and Microsoft isn't cool yet either. This will be an interesting campaign to watch!